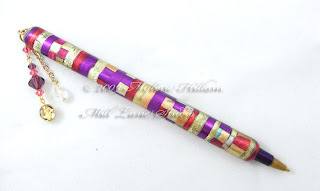 This weekend I'm conducting the first of my Friendly Plastic Pen classes at Stamp Antics. If you've been following my blog you'll have seen a number of these pens gracing my posts over recent weeks. This particular one is called Royal Orchid and is a gift for my dear friend who celebrated her birthday yesterday. I packaged it up in a neat little presentation box and it looked like a million dollars - a really practical, yet arty-crafty, gift for a very dear friend. She was absolutely delighted to receive something made just for her, and I loved making it for her as much as she loved receiving it. If you're interested in learning how to make your own (start making them now for Christmas!) then check out my website for class details. Bookings can be made direct with Stamp Antics but be quick because the morning class is already full and there are only a couple of places left in the afternoon class. But if this weekend doesn't suit, there is another class scheduled in June.